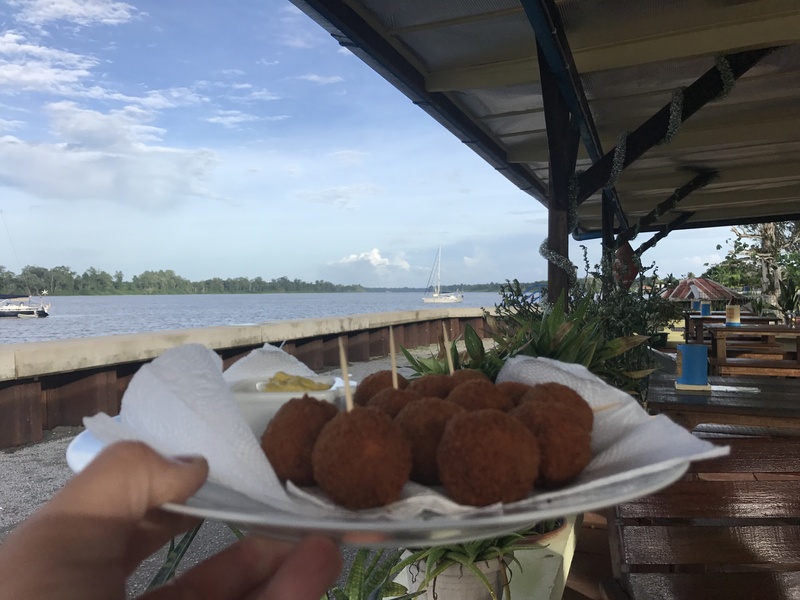 Last time we arrive in Suriname after 14 days at sea we expected to be met by pipe bands and exotic dancers throwing leis over our necks and pouring our a celebratory glass of ice cold champagne – needless to say we were bitterly disappointed. This time we had dampened our expectations somewhat and therefore the reality surpassed them. The water turned brown and the jungle came to meet us. So many different colours of green and shapes of vegetation. For the first few miles. 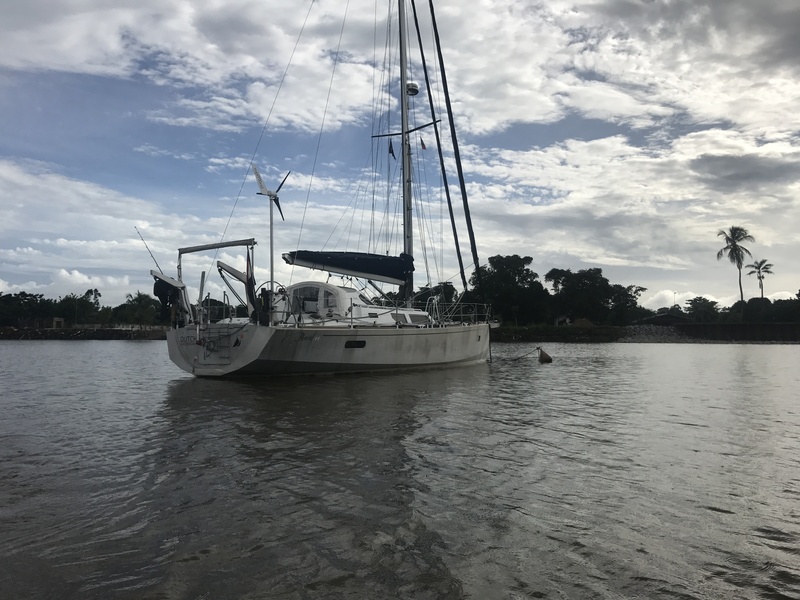 With 2.5 knots of current against us our progress was slow and we were hit twice by bizarre squalls on the river with 35 knot winds and the thickest rain I have ever experienced. It was impossible to see your hand in front of your face, not to mention the pounding pain on your eyeballs if you tried to open your eyes at all. That said, we were in good spirits and pushed on to pick up a mooring in Domburg in late afternoon. “A mooring in Domburg?” you ask intrigued. The last time we were in Suriname, Domburg meant anchoring precariously on a rapidly flowing muddy river, taking your dingy in and climbing a muddy bank to a small square with a little local Eethuis where Rita would serve a full meal of rice, beans and chicken accompanied by a 1L djogo of beer for about 2 euros and if you were lucky you could score 100L of extra water to tie you over to Trinidad. Rough but with a simple and special charm. That Domburg of 2009 no longer exists. Instead there are tidy moorings, a solid dingy dock, a rather fancy looking clubhouse/snack bar, showers and a swimming pool! Within 5 minutes the monkies were in the pool and we were handing on the bar drooling for some of Rita’s delicious rice and chicken spiced up with her own special flavours. Only to be disappointed to find that the menu only contained typical Dutch pub fare. Fortunately this included bitterballen. And anyone who has even tasted bitterballen will probably agree that it is very difficult to stay disappointed for long in their presence. On the morning of Day 2 we were picked up by Riccie at 0800 to start the inklaringsproces in Paramaribo. Although the check-in process for Suriname is significantly more structured and consistent than that of The Gambia it is still long and time consuming and often leaves you staring dumbfounded or scratching your head wondering what kind of crazy creativity spawned such a complicated bureaucratic process. A two hour drive to Paramaribo (shopping traffic before Christmas), get money from the ATM, stop at a locket to change the Suriname dollars back into euros (at a loss) as the Ministry of Foreign Affairs will not accept their own local currency (the currency has halved in value in the last 15 months), then to the port authority or Maas, to the local police, customs and immigration filling in reams of documents, sharing multiple copies of boat registrations, a picture of the boat for the local scrapbook, proof of ownership, proof of insurance, crewlists, passports, etc. etc. It was 1400 before we were legal and could begin to explore this fascinating country. Time to explore. Njoy your stay overthere! Hi Rhiannon! Too late for you, unfortunately, but the new owner of River Breeze (the clubhouse) has put nasi and bami on the menu! Just stay as long as needed to get what you want :). That’s just what we did :).